At best, 4% of your web site visitors are ready to buy right now. But what about the other 96%? When they’re not ready to buy, they’ll leave and probably never come back. That happens on most web sites and instead of trying to fix it, these companies simply increase their marketing budget to generate more leads. Or they split test things like headlines and calls to action — all designed to increase their conversion rate right now. But think about yourself as an example — how often are you ready to buy immediately, compared to researching, reading reviews and learning about your options? If you answered “not very often”, then why assume your potential customers are any different than you? They’re not. Even when leads arrive at your marketing web site, most of them will buy something — either your product or a competitor’s, but they’re not ready to buy right now. They will be in a week, a month or a year, though. 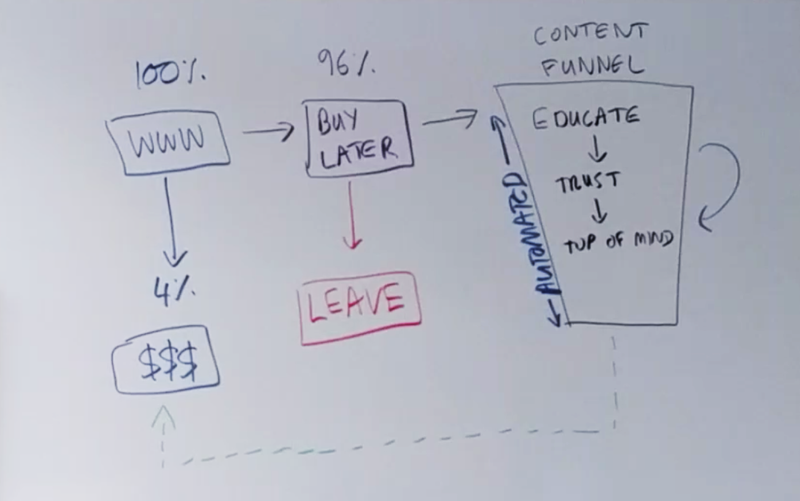 Instead of letting them come to your site and leave forever, why not invest in building an automated content funnel? You can boost your conversion rate from a standard 4% to 8%, 15% or 20% using content and marketing automation to position yourself as an expert while helping your future customers solve their other problems before they’re ready to buy your product, which will solve their “main” problem. When they’re ready to buy, they’ll trust you, you’ll be top of mind and purchasing your product will be the next natural step. No “sales tactics”, end of quarter discounting or funny business required. When I think of a real world example of a content funnel that generated millions of dollars in revenue, I think back to when we launched Bigcommerce in 2009. We hadn’t raised any money (yet — but raised $125M on the back of our content funnel starting in 2011) and so our marketing budget was tiny. To get the ball rolling, I started writing educational blog posts and recording videos which I would post on Youtube. I’d teach small business owners how to grow their business, boost web site traffic, increase referrals, etc — all topics that were important to our potential customers. I would then use that content to drive sign ups at our web site. The content funnel I built was a huge reason we grew to 9,800 (we just missed our goal of 10,000) paying customers, 100,000 email subscribers and 1,000,000 views on Youtube in our first year. So believe me, it works.